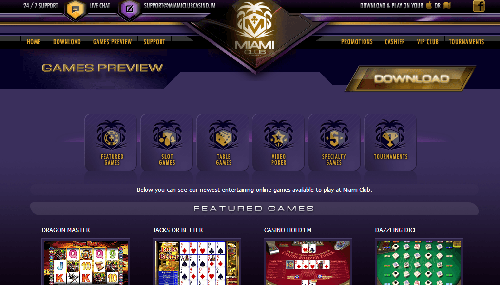 The Miami Club Casino is a small online site with games offered by Wager Gaming, which has changed names (but not products) several times over the past decade. With about 150 total video slots, video poker games and table games like craps and roulette, most players will find something interesting, including daily Free and Pay-to-Play tournaments. Games scores the lowest-mark as the Miami Club is limited to WGS Technology Software, however you can still have lots of fun here, especially when playing with some very generous Welcome Bonuses. Banking is also a little limited but, if you like the available methods, you’ll find transactions are a quick and easy process, and carried out in a secure and trustworthy environment. Customer Support is also on hand 24/7. Deposit quickly and easily in a secure environment to enjoy big bonuses and fun games at the Miami Club! 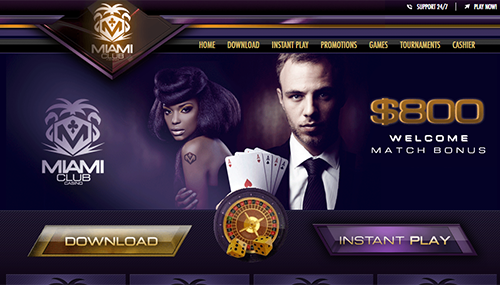 Miami Club offers no-deposit bonuses for free spins or small “playable” cash, such as €/$10. These require the player to play a minimum of 40-times the bonus cash, and then make a deposit to prove who they are, and then they can cash out their winnings provided they are not over €/$150. The standard “Welcome Bonus” is a 100% match, and players are required to play-though both the deposit and bonus 20-times (there is a minimum deposit of €/$25 to qualify for any bonus).That means a €/$100 deposit and €/$100 bonus must be played until €/$4,000 in wagers have been made. The bonus is sticky, meaning it is for play only and cannot be cashed out. Make sure you check the “rules and promotions” sections, as they change from time to time. At one time, only slot play counted toward rollover requirements. Currently there is a sliding scale for all table games. Blackjack counts for just 10% of total action, so that €/$4,000 in wagers becomes €/$40,000. Unfortunately, the only table game that does not count for any action is roulette. That means if you play roulette exclusively you should just call support and tell them to forget the bonus. Miami Club does offer a VIP Club to provide loyal customers some freebies. There are daily and weekly promotions including Free Slot Tournaments, free spin offerings, and reload bonuses. Comp points are rewarded for all play, equal to most other online casinos, at about €/$1 for every €/$1000 in total action. The VIP club has several levels, based on overall play – the more your play, the higher the level – and the exchange rate for wagers to reward increases slightly as play increases. There are about 150 games available at Miami Club casino. The graphics on the slots are not as strong as some other software providers, but the games do play smoothly with standard internet speeds. Slots like Amazing 7’s and Super Soccer play well. Limits run from a penny to €/$1, and Keno is available at €/$1 to €/$10. 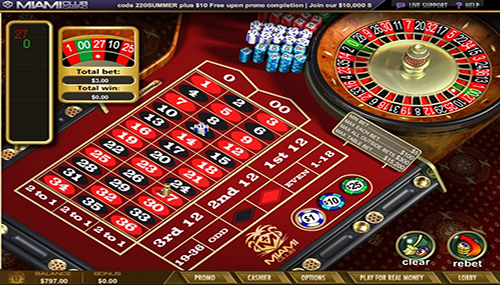 You’ll find traditional slots, bonus slots, 3-Reel Slots, 5-Reel Slots and 7-Reel Slots that provide a lot of fun. There are also a dozen progressive slots. Video poker is available on standard games like Joker Poker, Jack’s or Better and a few others. Single line games and 2 to 4-line games are also available. In the Mega Multi Hand variety (up to 100 lines) you can play from 50-cents to €/$100, but only on Deuces Wild, Joker Poker, and Jack’s or Better. Table games are also fairly standard, with seven to choose from like Mulligan Poker, 10- High Poker and craps, baccarat and others. Blackjack is also offered in seven varieties. Limits on table games usually run from €/$1 to €/$500. Roulette is slightly different, with a limit of €/$1 to €/$100 on inside straight-up bets, to €/$300 on outside wagers (even money and 2 to 1). Unfortunately, the roulette offered is generic, with American double-zero and European single-zero wheels. Spins average four revolutions before the ball drops, stops, and the number is highlighted in the history bar. Miami Club offers players plenty of traditional casino game options, including American and European Roulette, Vegas Single-Deck Blackjack, Hold’em Poker, Red Dog and Craps, as well as fun single-hand, multi-hand and 100-hand video-poker action like Bump It Up Joker Face. Slots are also very popular down at the club with 3-reel, 5-reel and 7-reel varieties, and featured games like Triple 10X Wild, Funky Chicken and Wheel Of Chance. Miami Club Casino is powered by a WGS Technology Solutions Software Platform that is available in instant-play and download. The platform offers around 100 slots such as Karaoke Cash, Crazy Cherry and Cash Grab, several progressive jackpot slots, and a selection of online table games, video poker and speciality games like keno and bingo. Like with many software companies, graphics and sounds progress with each newer batch of games. If there is a common complaint from all online players, it is the speed and difficulty of withdrawing funds. Miami Club isn’t any faster or slower than the average casino, but there are not many options. If you manage to meet your bonus requirements and want to withdraw some cash from your account, be ready to jump through some hoops. First, you’ll need to download (from the Cashier link) the FaxBack form to verify you name, ID, address etc. Once this has been scrutinized and accepted (expect a week), you can make a withdrawal. The standard withdrawal is processed within 72 hours. US wire transfers are subject to a €/$60 fee and take up to 10 business days. Checks can be sent, but not delivered to PO Boxes. These are subject to a €/$30 fee. That’s about it for US players. No payments back to Visa are allowed due to restrictions by Visa International. Other players may use e-Wallets like Skrill and ecoPayz, and these are quick. Simple and secure is the Miami Club’s ethos on banking, and deposit and withdrawal currencies are limited to just Euros, US Dollars and Bitcoin. Due to the ease and speed of depositing with Bitcoin, the cryptocurrency has quickly become a popular way of depositing at online casinos. However, if you prefer the more traditional methods, you can deposit Euros and US Dollars via Visa, Mastercard, Skrill, Neteller, Eco, Sofort, Paysafcard and Quickcash. Going mobile at the Miami Club is easy, and all you have to do is enter m.miamiclucasino.im in the mobile browser of your latest Android, Apple or Windows Mobile Phone or other Mobile Device. You can even access the mobile-platform with your existing desktop log-in details, and access those all-important bonuses and promotions you could via your computer. You’ll be able to play some of the latest mobile-releases such as La Fiesta, Solomon’s Mines, Ramesses’ Riches, and Beat The Bank, and play several varieties of Blackjack, Roulette and Video Poker. You can even enter slots tournaments via mobile phones and tablets. If you head to the slots section, the Jackpot Slots are mixed in with the regular slots. However, if you scroll down to the bottom of the homepage you’ll see a Jackpot Shortcut which leads you to a table showing the progressive jackpots that are available. An example top-jackpot was $136,233.79, but each game’s pot changes with each spin of the reels. Some games even offer 3 different progressive jackpots. The Miami Club assures security of financial transactions with state-of-the-art billing platforms that guarantee third-parties will find it impossible to intercept important information. Meanwhile, they also operate the highest-standard of security protocols, in which is included the use of a 128-bit SSL encryption that guaranteed personal information and data will remain secure and confidential at all times. The casino also states no information will be shared with third-parties other than those companies used in the process of verifying a player’s identification and setting-up forms of banking, and Miami Club only deals with the most reputable of companies during these processes. Canada, France, French Republic, Israel, Moldova, Netherlands the. Once downloaded, the games at Miami Casino are fun and easy to play. The graphics are good, play is smooth, but these aren’t the newest slots on the market. In addition, the selection is somewhat restricted. Only moderate ratings can be granted for these issues, as well as the small number of ways to deposit and withdraw funds. The bonus is reasonable for slot players, since 100% and 20-times bonus and deposit is a reasonable offer. However, for table game players and video poker players the rate of return (and rollover) is small, at 10 to 35%. In addition, players using a credit card on their first deposit do not get the bonus! Make sure you read all rules carefully. Roulette players will be disappointed that none of their play counts at all toward rollover. This makes the bonuses, especially for roulette players, less than perfect and only worth a moderate rating.